Hiya crafty peeps! It's an exciting week over at Some Odd Girl as we're bringing you the new clear release! If you love animals, have lots of pets, or know people that fit that bill then this is going to be a great one for you- to kick things off let me present Cat Lady Kaylee! Now I can honestly say I have quite a few people in my life that this image would be perfect for- it's going to get a lot of use in my craft room for sure :) And see that paw print and heart paper? I'm going give myself a little pat on the back because I made it myself with the accent stamps from the set- I LOVE when you can do that! 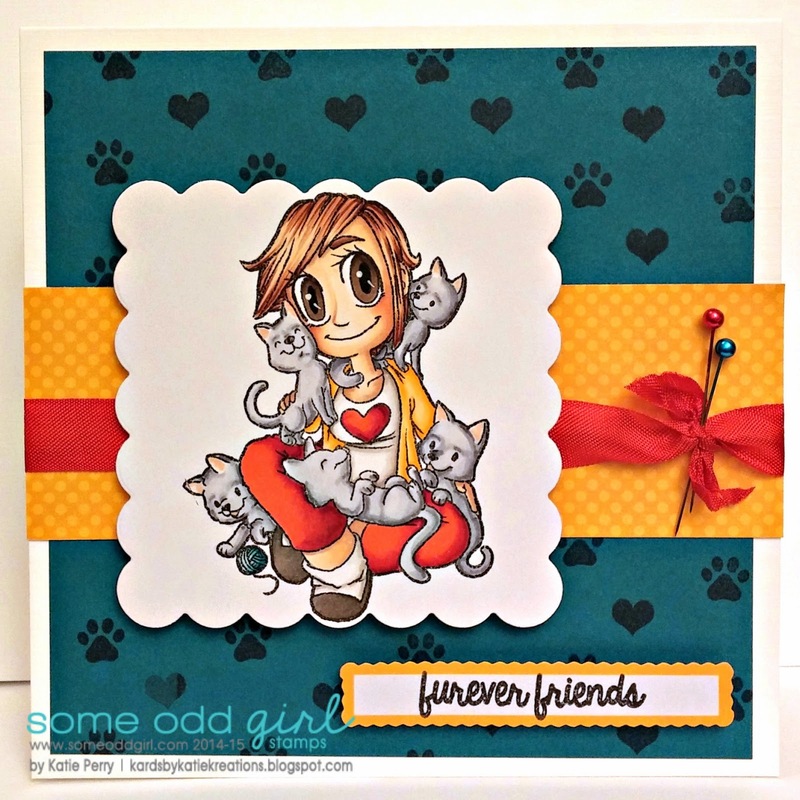 Now make sure you stop on by the Some Odd Girl blog to see some more amazing inspiration; and don't forget to pop into the SOG shop to grab up this cutie for your very own! Thanks so much for stopping by to visit me today- make sure you check back tomorrow for another dog gone cute release (can you guess what I just did there?) Hope everyone has a great day! Love, love love this card!! That background: FAB and the color combo ROCKS!!! Girl your coloring is flippin amazing! Just adore this card! Oh goodness I love this. The colors are so crisp. The Background is purrrfect.